7,625 others viewed this post. 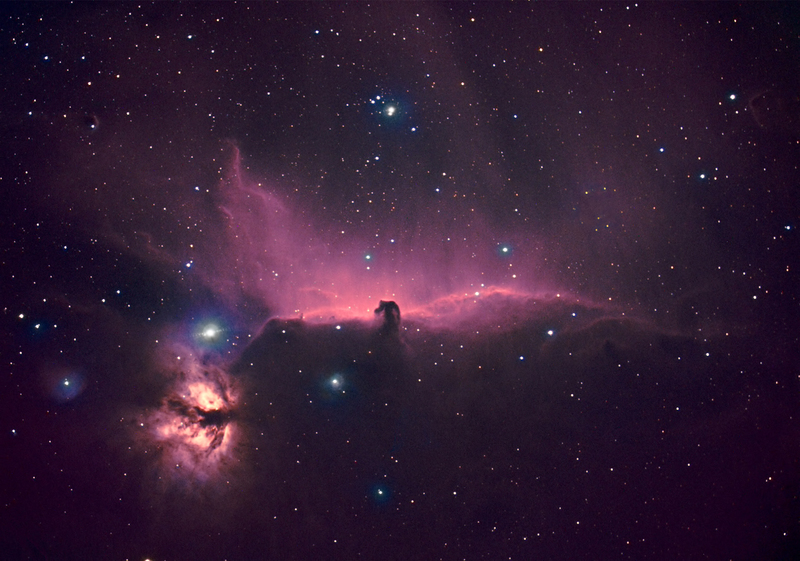 Here’s my Horsehead and Flame Nebula with full colour as promised! This is such a popular target for space nerds that you’re probably seeing it from other photographer accounts right now too, as it’s in season and prime for photography. Although popular, it’s actually pretty difficult to do well. That bright star Alnitak usually dominates the view, throwing light in all directions and obscuring the nebulosity. The Nebulosity is faint and takes a fair exposure so beginners have trouble with it. As usual I’ve rushed things and this image comes from only 12 exposures – 1hr Ha and 30 mins RGB. It’s a quick and dirty way to get deep space objects super fast! It’s a good method for people like me with day jobs and families and only short opportunities for standing in the dark chasing stars! To see how far I’ve come in one year since the last time this region was above my house, check out my first and second attempt 12 months ago. It’s embarrassing to look at now by comparison but I was just as excited at the time! HaRGB processing in Pixinsight and Photoshop. Taken with Hyperstar lens, and Baader high speed filters.